This article explores a simple method of extending the usable frequency range of a simple change over relay used for transmit / receive switching of RF in an external RF Power Amplifier. The RF is routed from transceiver jack to PA input and PA output to antenna jack on transmit, and from antenna jack to transceiver jack on receive, and the common configuration where the input and output jacks connect to one moving contact each is assumed. Of principal interest in this article the Insertion VSWR in bypass mode, ie when the transceiver jack is routed to/from the the antenna jack. 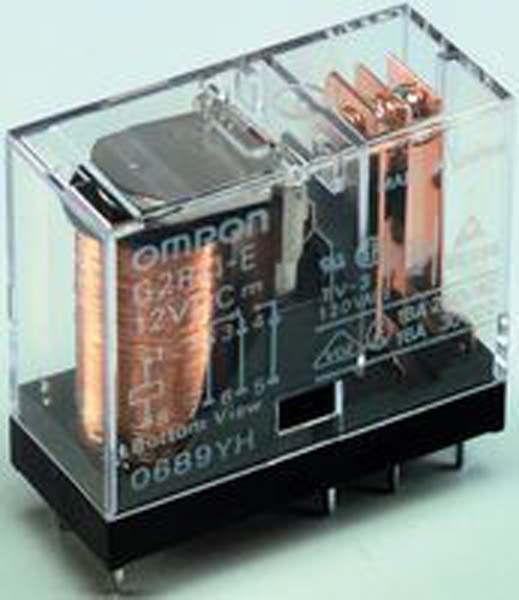 Fig 1 shows a common type of DPDT power relay that is often used for HF T/R switching. The white wire makes the common connection to the moving contact spring (flat copper strip) which moves between the NO and NC contacts. The U shaped loop formed by the white wire and the relay contact spring can be approximated as a small inductance of the order of 10nH depending on actual dimensions. Fig 2 shows a SPDT cradle style relay which again has a U shaped loop formed by the central moving contact spring and the return path via the NO or NC contact and supporting spring. 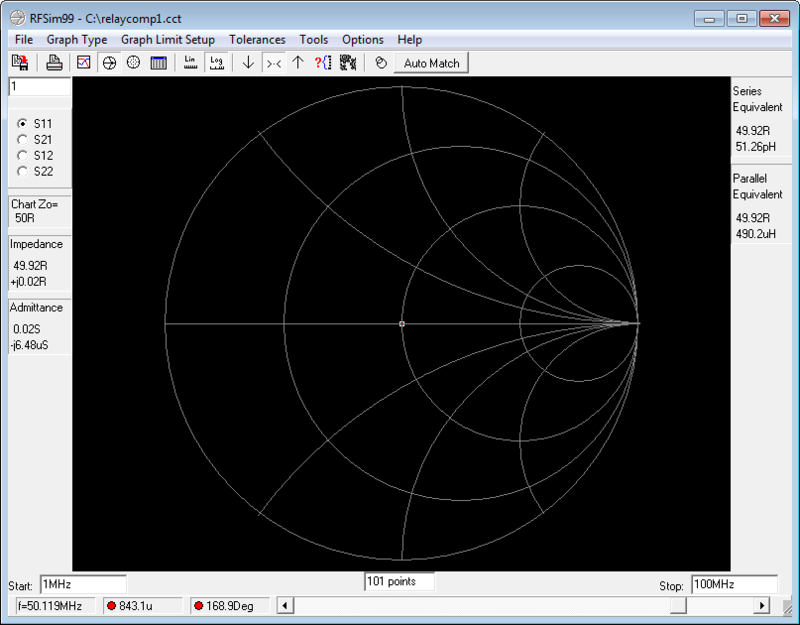 The U shaped loop formed can be approximated as a small inductance of the order of 5nH depending on actual dimensions. Let us analyse the case of a single DPDT relay used for T/R switching of RF in the PA bypass position. Fig 3 shows a model of the type of relay in Fig 1. Taking the inductance of the relay loop to be 15nH, in the bypass position of the relay both inductive loops appear in series as shown. Fig 4 shows S11 for the configuration. At 50MHz, |S11| is 0.1, so Insertion VSWR=1.22 and rapidly getting worse as frequency is increased (clockwise around the spiral). Fig 5 shows addition of a small capacitor to compensate the contact inductances. Fig 6 shows S11 for the compensated configuration. At 50MHz, |S11| is 0.0008, so Insertion VSWR=1.002 and remains excellent as frequency is increased (clockwise around the spiral) to 100MHz. The model here shows an approach when the pair of contact sets have a significant length of coax between them. Fig 7 shows the compensated configuration. Small capacitors are added to each end of the coax between the contact sets. Fig 8 shows S11 for the compensated configuration. At 50MHz, |S11| is 0.002, so Insertion VSWR=1.004 and remains excellent as frequency is increased (clockwise around the spiral) to 100MHz. Firstly, compensation is not a means of offsetting bad layout. Use short direct connections, bond the coax braids together as close to the relay terminals as possible so as to minimise the length of the centre conductor path via the relay contact from braid end to braid end. Install one or two small trimmer capacitors as appropriate, and connect the PA in bypass mode between and transceiver + VSWR meter and a dummy load so that the Insertion VSWR can be observed on relatively low power. Then adjust the trimmer(s) for minimum VSWR at the highest operating frequency. If using the configuration in Fig 7, keep both trimmers equal. When the optimal capacitance is found, carefully remove the trimmer(s) without changing its value, and measure it with a capacitance meter. 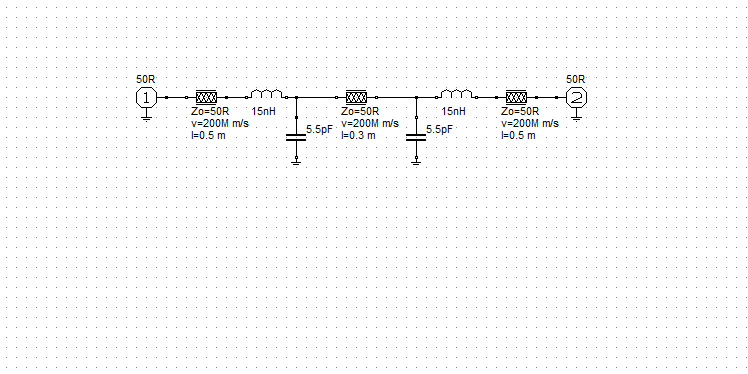 This is quite a small capacitance, so it takes care to measure such a low value, deducting any test fixture capacitance. Replace the trimmer(s) with quality RF capacitors of adequate voltage rating to withstand the maximum exciter power with allowance for some mismatch. Measure Insertion VSWR again to check the results. 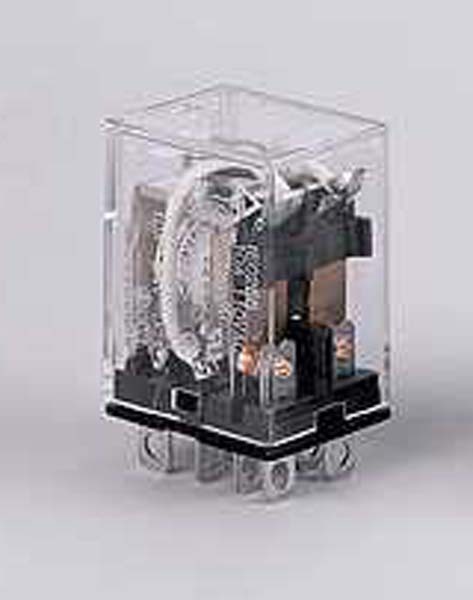 A open circuit transmission line can be used instead of a capacitor for the compensation component. Fig 9 shows that again, it provides excellent compensation to 100MHz for the given scenario. There are other configurations of relay contacts used, and the technique may be applicable but attention must be paid to the required voltage rating for the compensating capacitors and any interaction with the signal path through the amplifier in other than bypass mode. Some types of common power relay can be compensated to reduce Insertion VSWR at higher frequencies, extending their usable frequency range in RF T/R switching.